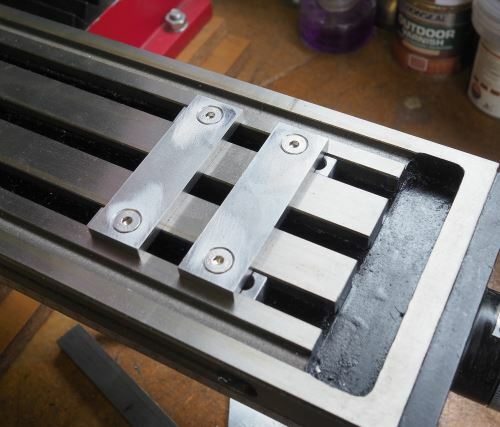 This clamp idea came about as I wanted to machine a large plate that was too large for the milling vice. 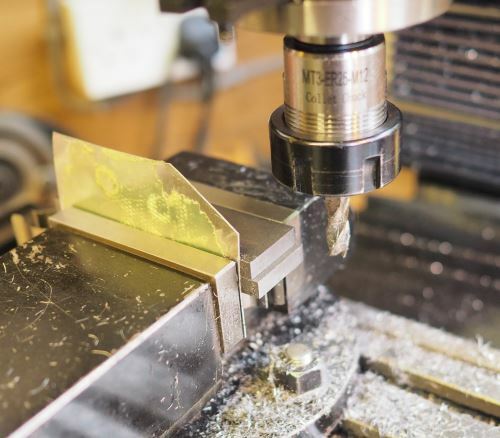 I thought that two pieces of bar stock, clamped to the table with compliance in one of the bars that could then be loaded with grub screws thus applying a clamping force to the work piece. 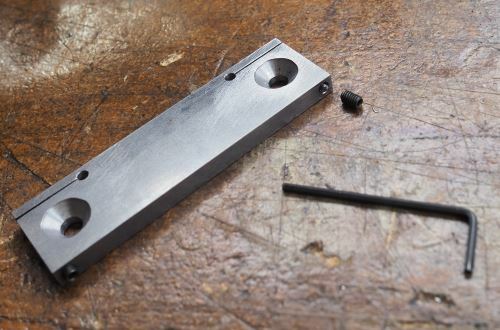 The 1/4″ bar stock was chosen as this is very low profile and gives me enough material to get grub screws through the thickness of the material. 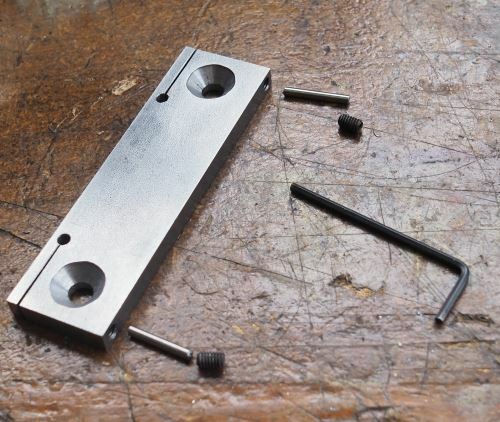 As this is all made from mild steel it is very easy to machine and work with. 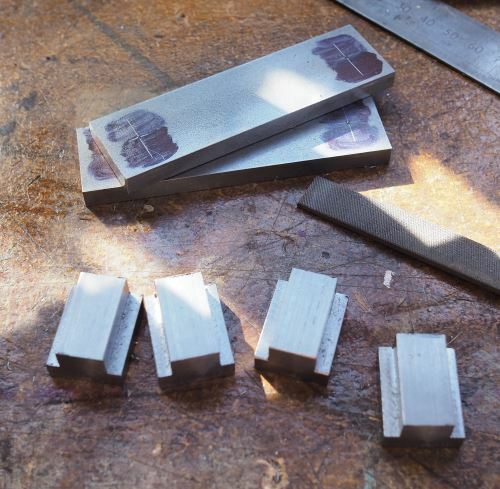 Two 1/4″ thick bars 1″ wide and 90mm long. 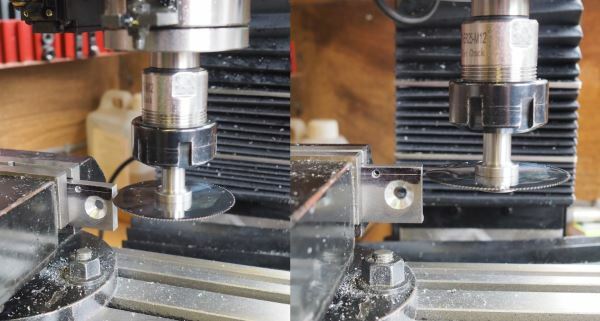 The ends of these two bars were milled square, holding these together in the machine vice requires a lot of force and any slight movement in the vice means that one of them will be held better than the other. One trick to solving this is to use a thin shim of aluminium as this is slightly softer and the compliance means both parts are held. 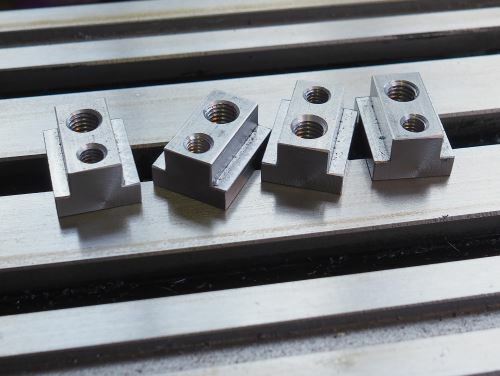 The 4 blank T-nuts were machined out of mild steel bar stock as well. I had to make the T-nuts as the intention is to use 6mm countersunk bolts and 12mm T-nuts normally have 10mm threads. As the nuts are quite long and I only wanted 6mm fixings I thought it would be useful to make them multi-purpose and hence 6mm and 8mm threaded. Just trying the clamping bars on the table. These bars are 90mm long and they span the 3 T-slots, however, looking back these would be better at 105mm or 110mm long as that would give more space for the screws and tightening grub screws. Overall the bars clamp down well and there is enough movement in the T-nuts to allow the bars to be accurately positioned parallel to each other. The clamping is achieved by having a flexible slither that is moved using a grub screw. 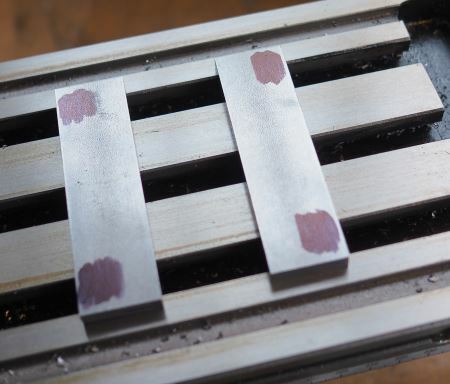 The above images show me lining up to make a cut using a slitting saw – this is a solid carbide slitting saw in a mandrel that I made. The hole that I pre-drilled at the end of the slot is to relieve the pressure and ensure that I don’t get a crack propagating from the sharp end. The finished clamping bar with slots, grub screws and pushrods. The pushrods are 3/32″ silversteel running in 2.4mm drilled holes then with 4mm grub screws. The pushrods don’t need to be a perfect fit, but cannot be too loose either as they could get driven into the sides of the hole and lock. So this ~2.38mm pushrod in a 2.4mm hole is about right. Clean the holes out thoroughly from the drilling and the tapping. Plus it’s a good idea to run a thin blade through the slot to clean any swarf out of here as well. 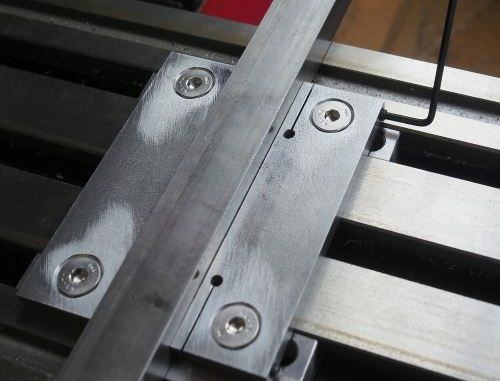 It’s best not to apply too much pressure with the grub screws unless the bars are loaded against a workpiece as the clamping fingers will get bent out of shape. In practise one against the workpiece these fingers of mild steel will hardly move. The first bar can be lined up using a square against the side of the table. 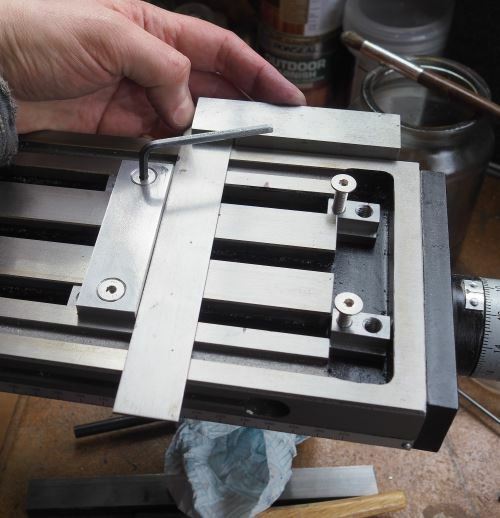 Then place the workpiece in place and slide the other bar up to the other side of the workpiece. You want these as tight together as possible before you even apply the load with the grub screws – you could clamp these with some G-clamps whilst you’re fixing them in place. Then carefully apply the load with the grub screws. I will have to do some calculations to calculate the maximum force I can apply in this way. Looks interesting. Might give it a go. Need to catch up on other things but I sure do like the idea of it. This is a great idea, and one I’m going to replicate for my horizontal mill. Thanks for posting!